Contribute to the CFRF's 2017 Giving Campaign! The Commercial Fisheries Research Foundation is the only fishing industry led research organization in New England … and we need your help to keep it going! Today is #GivingTuesday and the CFRF is kicking off its 2017 Giving Campaign. Please consider donating today (or any day!) to help the CFRF continue its efforts to involve fishermen in scientific research, increase access to and appreciation of the seafood harvested by the region's hard working fishermen, and develop new initiatives that sustain healthy fisheries and vibrant fishing communities across New England. The CFRF is a 501(c)(3) non-profit organization and all donations are fully tax-deductible. Since the CFRF’s inception in 2003, we have worked with over 135 fishermen as well as hundreds of fisheries scientists, managers, and culinary professionals to achieve our mission of supporting sustainable fisheries resources and resilient fishing communities. The CFRF’s work has covered a wide range of topics, including conservation gear engineering, bycatch reduction, lobster settlement and recruitment, spiny dogfish stock dynamics, discard mortality estimation, fish habitat characterization, shellfish larval dynamics, industry based biological data collection, underutilized species processing and marketing, socio-economic characterizations of fishing communities, supplemental fisheries surveys, offshore wind energy research, and seafood access and sustainability initiatives. All of the CFRF’s projects are carried out by teams of scientists, educators, chefs, and members of the fishing industry that work together to develop the project idea, execute work components, and apply results. The CFRF’s efforts have resulted in new tools to reduce bycatch, better data for stock assessments, and a growing sense of trust and cooperation among fisheries stakeholders. A major goal of the CFRF is to provide members of the fishing industry with the opportunity to help evolve and improve the management of fisheries resources and the efficiency of seafood supply chains. To do so, the CFRF has distributed over $1.5 million of compensation directly to fishermen for their participation, platforms, and invaluable input in CFRF projects. Conducting research and education that benefits that fishing industry is at the heart of CFRF’s mission, and we are very proud of our accomplishments to date. In an effort to continue and expand our work, the CFRF is requesting your support during this giving season. 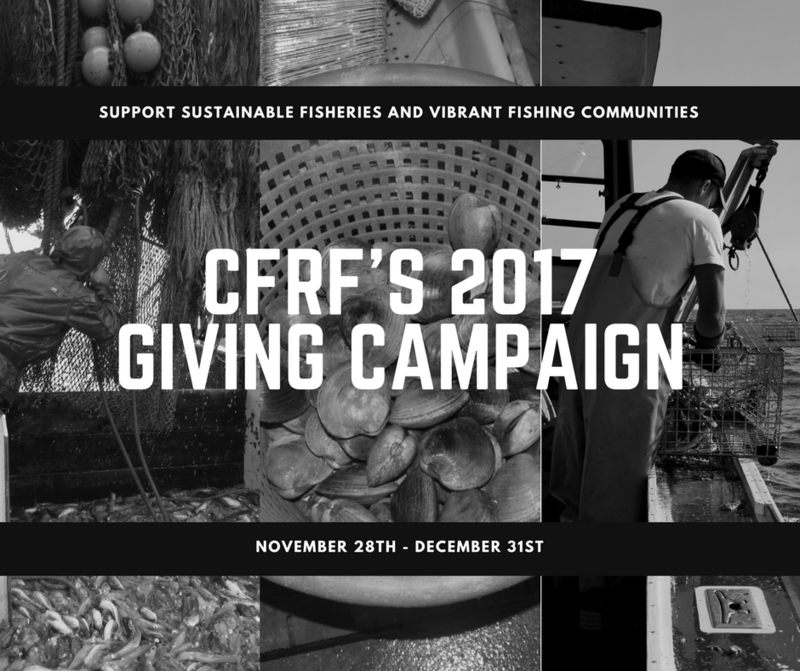 Donations of all sizes help the CFRF to achieve its goal of building a community of collaboration among fishermen, scientists, resource managers, chefs, and educators that promotes sound science, public engagement, and sustainable seafood. You can donate to CFRF online, via mail, or in person.